RealGrade 5.0 is a full-featured grading application designed to help University instructors score, grade and report students´ academic activates and exams quickly and efficiently based on the University grading scale. 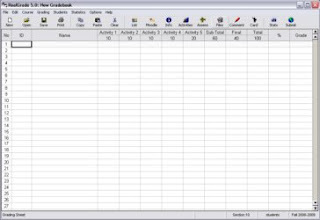 RealGrade 5.0 automates the tasks involved in documenting, managing, calculating and reporting grades, and provides a number of functions to produce attendance reports and course statistics useful in evaluating student performance and communicating results to students and administrators more effectively. As universities are moving toward the electronic and digital era with success, RealGrade 5.0 gives instructors the ability to spend more time planning instruction and less time having to do the time-consuming and traditional accounting work required when figuring scores and grades. Moreover, RealGrade 5.0 has the ability to produce standard and professional-looking print-outs with ease for the whole class or individuals. With proper training for instructors and full-utilization of RealGrade 5.0, all tracking and grading tasks can be accomplished by bushing a few buttons. - Simplified class setup process. - Import students' IDs and names directly from XLS or SIS. - Grade students using normal letter grading scales (A-F) or special letter scale. - Define and save course-related information and activities. - Class sizes of up to 500 students. - Add comments to students' grades. - Tracks up to 4 main categories and 36 assignments per class. - Protect grade books with password. - Track student attendance with absence warning indicators. - Copy, paste, clear and find editing functions. - Sort, add and remove students from the grade book. - Keep records for students' contact information. - Support different grading scales (under graduate, post graduate and custom). - Total point and percent weight of categories and assignments. - Built in e-mail functions. - Generate individual student report (grade card). - Send students grades by e-mail. - Generate high-quality and good-looking print-outs. - Submit grades directly to SIS. - Export to XLS and HTML formats.